Do you want to hire an Accountant and you need an Agreement? We provide a professional Business Agreement Template Between Client and Accountant which can be used when you want to hire an Accountant or you need to draft an Accountancy Service Agreement with a company. 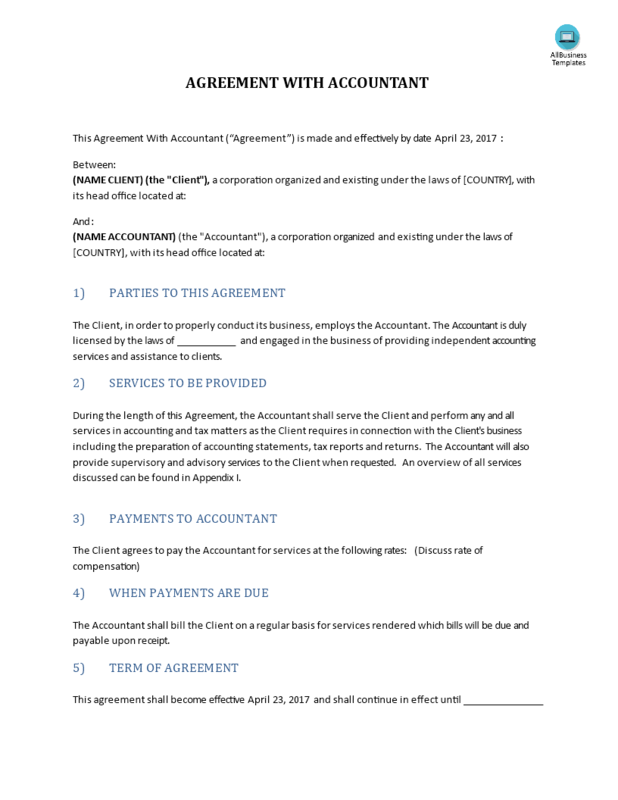 Download Agreement With Accountant Template between Client and Accountant. You just kickstarted your company or startup and suddenly you are in charge of managing all the financial records of your business... No worries, you have the option to outsource the financial work to an Accountant, or you look for our top accounting templates on this website! For you, in order to properly conduct your business, it’s useful to employ an Accountant. The Accountant is duly licensed by the local laws and engaged in the business of providing independent accounting services. During the length of this agreement, the Accountant shall serve the Client and perform any and all services in accounting and tax matters as you require in the connection you’re your business including the preparation of accounting statements, tax reports, and returns, etc. Besides this, the Accountant will also provide supervisory and advisory services when requested. Download this Accountancy Service Agreement Template if you are in this situation and save yourself a lot of time, efforts, and lawyer fees, etc!